Excited Utterance Hearsay Exception - В сложной финансовой ситуации приходит на помощь кредит наличными в Казахстане. I have discussed that hearsay is inadmissible evidence. Again, hearsay “is a statement, other than one made by the declarant while testifying at the trial or hearing, offered in evidence to prove the truth of the matter asserted.” Fla.Stat. 90.801(1)(c). While hearsay is inadmissible, there are exceptions that allow hearsay to be admissible at trial. One hearsay exception is known as an “excited utterance.” Typically, this hearsay exception is more applicable in criminal trials than civil trials. 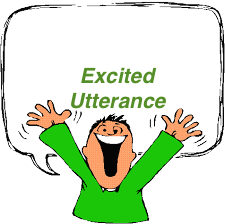 An excited utterance is a “statement or excited utterance relating to a startling event or condition made while the declarant was under the stress of excitement caused by the event or condition.” Fla.Stat. 90.803(2). An excited utterance is admissible even though the declarant of the statement does not testify to making the statement at trial. Smith v. Florida, 2016 WL 64341, *4 (4th DCA 2016) (internal quotation omitted). For example, Smith was a murder trial. At trial, the murder victim’s daughter testified she called 911 and told the 911 operator that her aunt, the criminal defendant’s sister, told her that he seriously hurt the victim. The aunt then called 911 telling the operator that she saw blood and pleading with the operator to send help. In response to the 911 calls, the police discovered the victim stabbed to death. At trial, the aunt denied making the statement to the victim’s daughter that the defendant told her that he seriously hurt the victim. The aunt, of course, was not the most credible since the defendant was her brother. The issue was whether the daughter could testify what the aunt told her (that the defendant told the aunt that he seriously hurt the vicim) since the statement constitutes hearsay. The appellate court affirmed that the daughter could testify what the aunt told her since the aunt’s statement was an excited utterance: a) the startling event that caused the aunt’s nervous excitement was the thought that the victim was seriously hurt or dead; b) the aunt made the statement to the victim’s daughter immediately after she heard from her brother; and c) the statement was made before the aunt even called 911 so it was clearly made while the aunt was under the stress of the event and before there was time to make any misrepresentation. Further, the startling event the aunt experienced was supported by the aunt’s independent 911 call.